Last year, we went to a lot of the summer programs at the library. We are doing the same this summer. It has been a lot of fun and quite a variety of items to do. Last year, one of your favorite items was the kid style chocolate blind taste testing. This week, they decided to do something similar, but with jelly beans. NHL, I knew that you were going to be in heaven since you adore jelly beans. I will admit I was worried about JSL. Since I was nervous about JSL’s reaction, I made sure not to talk too much about it before we arrived. As we began, the two of you were excited because all of the kids were thrilled about the prospect of candy. JSL, as I suspected, you were not overly thrilled with the jelly beans. You started to pout and get upset. I made a deal with you that I would cut the jelly beans in half and you did not have to eat any that you did not like. Thank goodness the purple jelly beans that we began with were very tame and you seemed to enjoy them. Things fell apart a bit by the time we arrived at the pink. You got through most of the green and then NHL helped to let you know ones to avoid. NHL, you were in love with this activity and not just because of the candy. When I looked over, you were well into the second set of jelly beans and recording your data. What shocked me was you did not simply put an “x” next to your favorite. You had a system. You gave each jelly bean a score from one to ten so everything was noted as you went along. This was really good thinking since JSL had a hard time keeping track of the flavors as he went along. Here’s a video that I made the two of you of the fun from the experience. 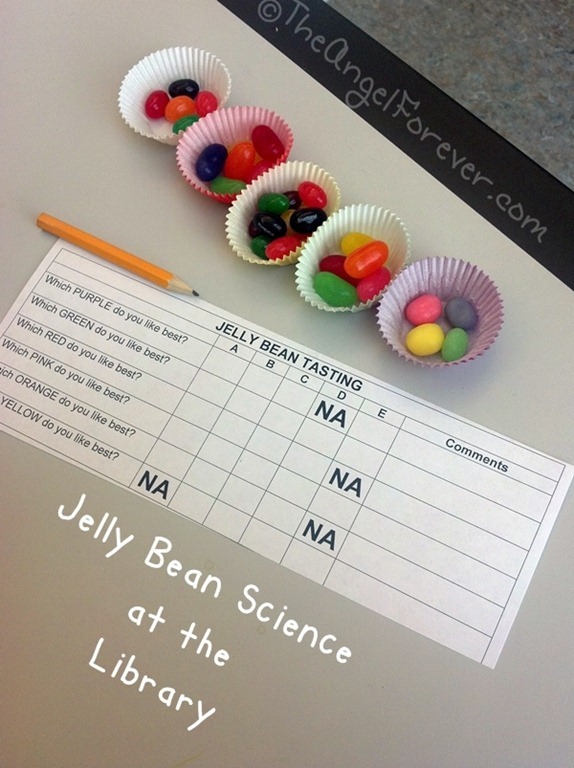 Something to remember the scientific study of jelly beans. We had a great time and talked about how scientific the sheets were and what other items could be done in a similar fashion at home. The best part was that everyone had fun, JSL tried new items, and NHL explored data collecting. I know I can’t wait to check out more of the events the rest of the summer and make more memories with the two of you.